Have you ever seen a fossil? A fossil is any evidence of past life preserved in sediments or rocks. Do you think you could have dinosaur fossils in your family car’s gas tank? Did you ever hear that oil and natural gas are “fossil fuels”? Do you think oil and natural gas can be made from fossils? How long do you think it takes fossil fuel to form? Oil and natural gas together make petroleum. Petroleum, which is Latin for “rock oil,” is a fossil fuel, meaning it developed naturally from decaying prehistoric plant and animal remains. Millions of years ago, much of the Earth was covered with swamp. Prehistoric plant and animal remains washed into the seas along with sand and silt. Layers of organic materials piled up on the sea bottom. These thick layers were buried by mud, sand, and silt that trapped the organic material. Without air, the organic layers could not rot. The mud thickened and pushed down on the organic material with increasing pressure. The temperature of the organic material also increased as other processes in the Earth produced heat. Mud sediment was buried by more sediment. Sediment changed to rock as temperature, pressure, and anaerobic bacteria—microorganisms that can live without oxygen—increased. Thus, ancient plant and animal remains have been “cooked” by these processes and slowly changed into crude oil. Crude oil is held inside rock formations, similar to the way a sponge holds water. 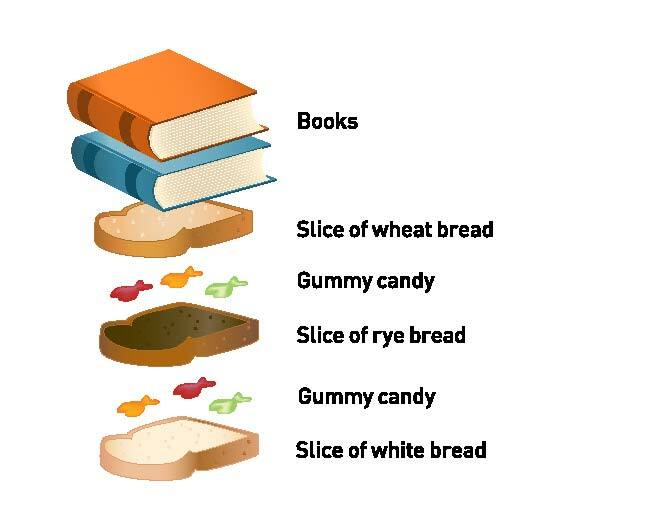 Place a paper towel, three to four gummy fish, and three slices of bread (one each of rye, white, and wheat) on a table. Carefully pull the crust from the bread. Place a piece of white bread, representing the sandy ocean floor, on top of a paper towel. Put a gummy fish on the bread to represent dead marine life. Place a piece of rye bread on top of the white bread layer, representing the way ocean currents deposit sediments on top of dead marine life, settling on the bottom of the ocean. Now add the remaining gummy candy, then the last slice of bread. This represents the natural processes that have taken place over millions of years, as more sand and sediments have been deposited by wind and ocean currents. Fold the paper towel to cover your bread fossil. Something is still missing to help your fish fossilize: pressure. Place heavy textbooks on top of the bread to simulate the natural process of pressure. Leave your model one or two days to represent the passage of millions of years. After one or two days, observe the bread fossil. Push a clear straw straight down into the bread and pull it back up to “extract” a core sample. Observe the layers through the straw. Try to separate the layers of the bread. Why do you think the layers are difficult to separate? Try to extract the fish. Can you identify the fish fossil’s mold (impression in the bread)? How about the fossil’s cast, which is the mineral material that fills the hole left when the fossil is gone? Compare the colored residue of the gummy fish in the bread fossil to the remains of the plants and animals that seep into rock. The residue left by the gummy fish represents oil deposits left behind by dead ocean plants and animals. Over millions of years, these remains are pressurized to become oil and natural gas deposits. Visit www.energy4me.org for more energy education classroom activities and resources.